Vice President Larry Sassa called the meeting to order at 6:36 p.m. Directors present for the meeting were Bonnie Brooks, Errol Daniels, Susan Haag (via phone), Dennis Harrison, Stan Lambert, Franz Lerch, Todd O’Donnell, Ty Payne, Larry Sassa, Paul Smith, Lamar Strother, Douglas Tillett, Stuart Toomey, and Jim Van Cleave. Directors Doug Alred, Jane Alred, Angela Harris, and Larry Roberts were absent. Approval of 4/3/18 (April meeting) minutes: On a motion by Stuart Toomey and seconded by Paul Smith, the April board meeting minutes were approved as submitted. Treasurer’s Report: Treasurer Bonnie Brooks distributed copies of the Balance Sheet and the Profit and Loss Detail Statement through April of 2018 and meticulously explained all the line items. 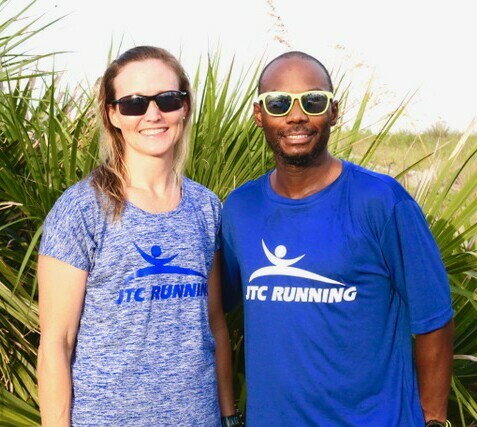 As she thoroughly went through the line items, discussed the income and expenses as pertaining to the Jacksonville Bicycle Pedestrian Advisory Committee donations, National Running Day entries, Race Team entries, and other expenses including the Distance Carnival track meet. JU Running Lab – Todd O’Donnell reported the most recent numbers and statistics from the running lab. The numbers were similar to the previous reports. Again, it was brought up about the use of advertising to local coaches to increase the awareness for high school teams. Todd also reported that some of the lab graduate assistants were graduating, however the assistant we are funding will be returning. With our budgeting period approaching in August, the finance committee and board will need to review and discuss the effectiveness and cost benefits of the Running Lab to the club. Will need to focus on whether the money being spent is benefiting our members and the running community. Run, Jump, Throw 2018 – No report was submitted as event coordinator Angela Harris was absent. Event is scheduled for this Saturday (May 5th) at Jean Ribault High School. This event will be targeted towards elementary students as an introduction into track and field. Merchandise Committee Chair open – Larry Sassa stated that we are still looking for someone to take over our Merchandise Committee. Stan Lambert, who is currently assisting with the Merchandise Committee, reported that he would get information regarding Logo Express and their services and prices. National Running Day – National Running Day will be June 6 and we will once again partner with Marathon High and 1st Place Sports for the fun run and cookout. Sign up is active on the website and the offer for members to extend their membership will once again be in effect as part of their donation offer. Todd offered to assist with the grill and the tent will be set up. Summer Camp Scholarships – The application period has been extended and will be open for about another 3 weeks. It was previously reported that there were at least 20 applications submitted already. We will need to contact Brevard Running Camp to coordinate arrangements and all details. Awards Banquet – The awards banquet is scheduled for Thursday, June 21st at Maggiano’s. Registration is available on the website with full event details. There will be an upcoming committee meeting for further planning for the Awards Banquet. Open Floor Discussion – No concerns discussed. Gate River Run (Sat 3/10/18) – The financial report will be submitted next month. Tijuana Flats Summer Beach Run and Kickoff (8/18/2018 and 8/6/2018) – Currently registration is open for Summer Beach Run. Planning and arrangements are going well, with the addition that we will be moving the finish line area up on the boardwalk similar to the Winter Beach Run layout. This will be better for race as we will have less issues and concerns with the finish line area and Jacksonville Beach officials. The SBR kickoff is schedules for Monday, August 13th, at the Lakewood Tijuana Flats. FINANCE – Bonnie reported that our fiscal year starts in August and there would not be another Finance Committee meeting until then unless some pressing issues arise. She also stated that she would not be at the June meeting, but would send the finance reports so that we would have them. MERCHANDISE – Stan reported that he would be assisting with merchandising duties in relation to Logo Express. COMMUNICATIONS: Newsletter, Social Media – The current issue has been printed and mailed. The newsletter is accessible via the email blast that has been sent out. Deadline to submit an article for the next issue is May 15th. Suggestions were made that we should focus on the layout and design of the newsletter. We should focus on specific targets in relation to time of year planning and relevance of content, not just filler stories and information. NEXT MEETING – The next board meeting will be Tuesday, June 5, at 6:30 pm in the Mediterrania Restaurant. The May meeting was adjourned at 7:25 pm.